Several of the nation’s largest tobacco companies are suing the federal government alleging that graphic warning labels on cigarette ads and packaging, planned to take effect a year from now, are unconstitutional. Claiming their First Amendment rights are being infringed, the companies say the required labeling amounts to “screaming” at potential buyers not to purchase their product, which is itself lawful to produce and sell. The lead lawyer for the tobacco companies calls the new warnings “direct advocacy to not buy the product, as opposed to a straightforward warning.” The companies may seek an injunction against the implementation of the new regulations. The Food and Drug Administration and the Health and Human Services Department and the officials who head them are the specific targets of the lawsuit. These are the primary government agencies that deal with public health. The FDA announced in June 2011 that new warning labels with graphic photos and the phone number 1-800-QUIT-NOW would have to cover half of each cigarette pack. Warnings first appeared on cigarette packs in 1965 but have not undergone changes in 25 years. Although the FDA has not issued any comment on the lawsuit, its official Web site notes that “tobacco use is the leading cause of premature and preventable death in the United States” and is responsible for nearly 500,000 deaths yearly from lung disease, cancer, stroke, and heart disease. The agency believes the new warnings are a major step forward in communicating the dangers of tobacco use and expects them to not only decrease the number of smokers, but save lives, increase life expectancy, and reduce health care costs. In particular, the FDA hopes that the gross images will persuade impressionable children and youth not to smoke. Learn about the context of the lawsuit involving free speech rights and the graphic new warning labels on cigarette packs. Read what Big Tobacco’s to lawyer has to say about the lawsuit against the government-mandated warning labels. 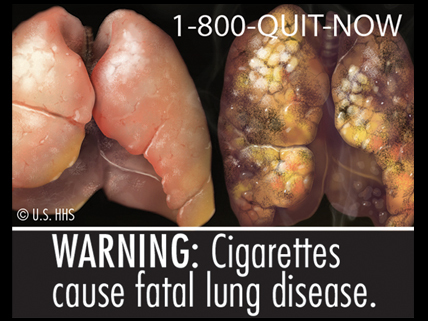 Learn how the planned graphic anti-tobacco warning labels were chosen and how they are intended to work. Freakonomics Poll: Will New Cigarette Warning Labels Reduce Smoking? Read how such regulatory efforts are likely to impact smoking. Read about the FDA’s new warning labels on its official website. my family has been against drugs and cigarettes for generations. and i agree with Nina, i think if someone is bored they should look for entertainment elsewhere. IT CAUSES HEART DIESASE, LUNG DISEASE, AND CANCER. IT CAN AND WILL KILL YOU SO DON’T DO IT EVER!!!!!!!!!!!!!!!! why would anyone want to smoke anyways? uhh this is a lung, not a heart. Thats why i will never smoke! thats what happpens when u smoke!terrible happen when u smoke! That is so gross! This is why you don’t smoke! my family has been against smoking and doing drugs for generations. I think that it’s just dumb to start smoking in the first place. Play informative for me, Mr. innteert writer. ew. looks like my poop. that is gross! for all the people that smoke out there you should really stop!!!! DUUUUUUUUUUDE! YOu have to have serious metal issues if you want your lungs to look like crispy chicken! ewwww i would hate that so much i hate when people smoke. 😛 ew. Why would you do something like that?! People should outlaw smoking! Vell i smoke and i is healthy!!! P.S I WOULD NEVER SMOKE!!!!!! WOW this is horible im never ever planning on smoking at all and i seriously mean that i dont want to die f lung cancer i want to be healthy and clean my whole life!!! it makes me wonder why they even decided to have ciggerates any way especially if you can die from smoking them like seriously no one wants to die from cancer! 🙂 thats what i have to say!! Think about how your kids will feel if you die before you get to see them get married or have kids. It is one of the hardest things to quit but you can do it. Believe in yourself. My advice is to carry gum or mints to keep something in your mouth so you are not tempted to smoke. Trust me, it works. well almost half of my hole family smokes and the only one that i know about that has cancer is my gram. Wow. That’s pretty nasty. I don’t applaud smoking at all. smoking is nasty. I mean why do people do this stuff anyway. You may be healthy now, but just wait till you’re 35 and you have lung cancer and can’t breathe! That’s why a lot of people are dying these days!!! who wrote this THE WEBSITE?? ?